The Perfect Spa Getaway For New Yorkers... Is In Jersey? The number of New York City residents taking Ubers to Edgewater, New Jersey will dramatically increase at the time of this article's publication. 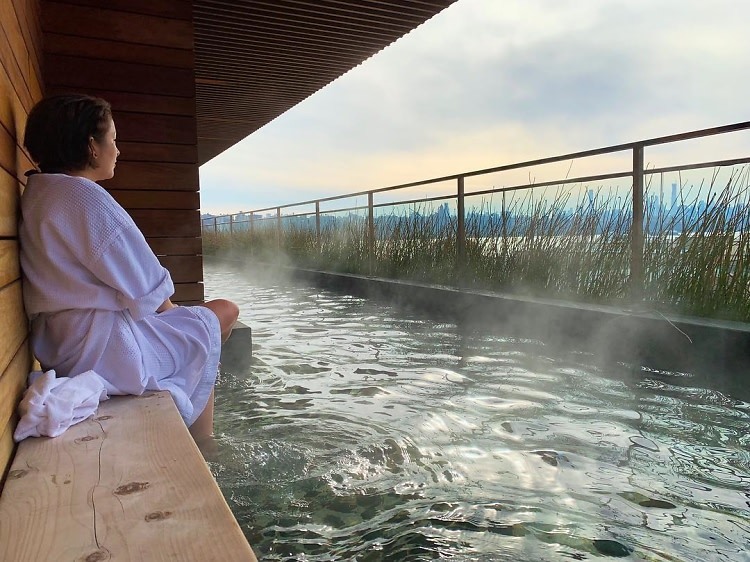 That's because there isn't a mecca more respite-giving than Sojo Spa Club, an eight-story sauna, bath house, spa and overall Insta-paradise of relaxation, and it happens to be located across the ne'er-crossed Hudson River. The facility is like an uncharted Guggenheim Museum, with similar architecture (Sorry, Frank Lloyd Wright. Don't roll in your grave for being compared to a New Jersey spa...), color scheme and level of supreme cleanliness. It's glaringly white—like Santorini, paint-eight-hundred-times-a-day white—and not a speck of dust is in sight. The attendants are pleasant, the amenities plentiful and the rooftop pool spreads ad infinitum. Basically, plan your trip ASAP. A no-shoe policy means cubby holes of footwear lockers are your first encounter on the ground floor. You're given a wrist-pass, like a Disney World Fast Pass, that becomes your locker number, door opener, credit card and day-long BFF. Next, you're given a fluffy robe and towel. No street clothes are allowed since the fibers from cotton and denim can mess up their advanced filtration systems. You might get lost in the locker rooms (and they have very confusing shower stations where you sit in a stone vanity station... can someone explain? ), and they're approximately 20 times the size of my apartment. Finally, you're sent on your way with a four-page map of the building's 25 amenities. Perks like Ganbanyoku Sauna, Outdoor Waterfall, Ice Room, Infinity Pool and more await. For best access, arrive early in the morning (it opens at 9 a.m.) to beat the crowds. Proceed to spend the whole day lounging in your plush bathrobe and your swimsuit. You officially have zero responsibilities and endless opportunities to take a dope selfie. An amenity highlight is the newly imported volcanic sand bath, a 15-minute partial burial in slightly wet, very warm sand from Ibusuki, Japan. Basically, Sojo has recreated the feeling and benefits of being buried next to a volcano. You're handed a traditional Japanese yukata, or cotton robe, that wraps you like a pink, floral burrito and don it in your skivvies. Yes, you should be nakey under a robe, laying in sand, in New Jersey. The experience is pleasant, like a weighted, hot blanket draped over your body. If the sun happens to peek through the windows, a piña colada appropriate parasol is placed at the top of your sand mound body. Ultimately, it's a fun tack-on to your day's admission for $20 extra. Pro tip: if partaking with friends, take pictures. Currently, day passes to the facilities cost a measly $50 on weekdays and $65 on weekends for all-day access (it is open from 9 a.m. to 10:30 p.m. every day). A round-trip Uber from Chelsea cost around $80, so you could woo your next Tinder date for a total of $180. There is a free shuttle from Midtown, but it fills up quickly and we recommend your own transportation. I think I've found heaven and I'm scared to admit that it is in Edgewater, New Jersey.